After a successful summer of youth international basketball summer for France, it was the turn of the CFBB to represent France. France had entered a team to play basketball at the sixth Jeux de la Francophonie in Beirut, Lebanon. All the players except for Morgiane Eustache from the CFBB are under the age 18. Most of the participants in the basketball competition sent senior squads which included players from the Ligue Féminine de Basket. Senegal, preparing for the African Championships, and Romania, using this competition as a training session for the qualification of Eurobasket Women 2011, came with established senior internationals. France were drawn in group A with Cyprus, the Republic of Côte d'Ivoire, Mali, Tunisia and Canada (Quebec). 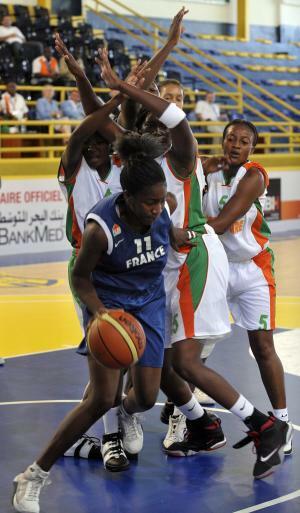 France opened the competition against the Republic of Côte d'Ivoire and lost (56-63). The coach of the Republic of Côte d'Ivoire for this competition is the current general manager of Nantes-Rezé Simon Guillou. 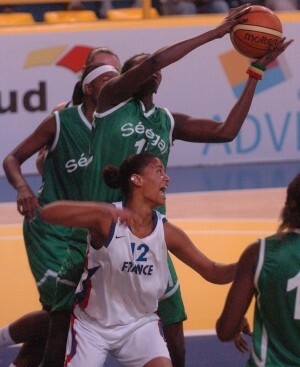 Adja Konteh (left in blue) led the French attack with 17 points while Florine Basque and Eléonore Grossemy scored 16 and 10 points each. The second match went well for France as they overcame Mali (62-48) with once again the trio Grossemy, Konteh and Basque leading the scoring with 14, 14 and 10 points respectively. Quebec, representing Canada, played a series of games in France during their preparation in the summer and also fell to France (55-64). Quebec led at the interval (27-24) but were unable to handle Basque during the second half of the match. Basque led the French scoring with 16 points while Konteh added 12 points. France made it 3 wins in a row after beating Tunisia (62-50). The game was tied (41-41) going into the final quarter. Grossemy (right in blue) led the scoring with 16 points while Konteh and Basque took a back seat. Christelle Diallo and Héléna Akmouche scored 13 and 11 points each. The final group game between France and Cyprus did not take place as Cyprus were withdrawn from the competition. France were drawn against Senegal in the semi-final. It was always going to be difficult for the young ladies from the CFBB as they faced Aya Traore, Mame-Marie Sy-Diop and Bineta Diouf. Senegal took control of the game early and led (21-12) at the end of the first quarter and never looked back as they went on to win (74-59) with Sy-Diop leading the way with 25 points. Basque (left in white) led the French attack with 15 points while Diallo and Konteh added 13 and 11 points each. France lost the bronze medal match against Tunisia (52-61). The two teams were tied (42-42) going into the final quarter but this time Tunisia held their nerve to win. Grossemy was the leading player for France with 18 points which included 4-of-7 from beyond the arc. She also took 9 rebounds. Basque finished with 12 points. Romania beat Senegal in the final (70-53) with Anita Meszaros leading the way with 28 points. Anne-Marie Parau, who played in the LFB two seasons ago, was in the Romanian squad. Claudia Pop, Ildiko Vass were also in the Romanian team. The games ended without a medal this time for the youth international basketball players from the CFBB.